What Makes A Great Staff Member? Camp Vega is a home away from home. It is where our campers feel safe, are able to try new things without judgement, sharpen their skills, build relationships and grow as people in so many ways. All of this is possible because of our incredible staff – they are the foundation of what makes Vega so magical. Hiring the right people for the summer is a task we take seriously, as our staff will set the tone for the summer. We asked some of our leadership team what they thought made a great staff member. Looking back when I was a counselor, I’ve been thinking, ‘what made those two years so memorable?’ Although I made friends that I still have to this day, was in a place that is beautiful beyond words, and learned many valuable lessons, it would have to be those sweet, somewhat rambunctious, happy 10 year olds! I truly learned to love them in the seven weeks I was their counselor. And that’s what it takes to be ‘the best’ counselor. Truly getting to know and loving them as individuals. 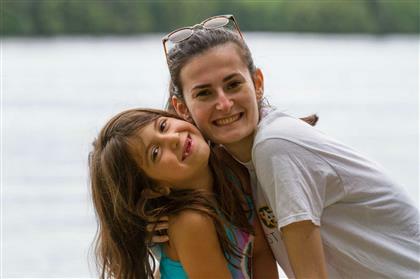 By doing that you will want to keep them physically and emotionally safe, you will want to watch them excel in their activities, you will want to be kind, nurturing, fun, creative and will want these girls to have the best summer of their lives. These girls are amazing and they will know if you aren’t truly invested in them and their well being. As a parent of a son who attends sleep-away camp, we all want our children to have ‘the best’ counselors. Because if they do, we know they are happy and safe…and that’s what matters most. A good counselor is someone who strives to maintain a positive attitude in their bunk and department. Positivity trickles down from counselor to camper and can change the entire tone of your environment. Setting this example can also help the campers be more positive in their daily camp lives. I have also found that a certain level of selflessness makes for a great counselor. The campers’ needs should always come first, and a good counselor balances this with their own camp experience. I think that the best counselors are those that build real relationships with the campers. The counselors that really show the campers they want to get to know them and are not only physically present in the bunk and at activities but really emotionally present as well. 1. Always reliable. A great counselor is constantly reliable day in and day out, not just some of the time. You can count on them to get the job done, meet deadlines, keep their word and provide consistent quality work both in their departments and in the bunk. They display integrity in their work ethic and interactions with campers and staff. 2. Communicates with confidence. Great counselors communicate their ideas honestly and clearly, and respect the views and opinions of others, especially the campers in their care. They believe in themselves, which also means being comfortable asking questions. Clear, effective communication done constructively and respectfully is the key to getting heard. 3. Being a team player. That means being open minded to other people’s ideas and perspectives. Supporting their fellow counselors is vital which brings unity in the bunks, departments, and camp as a whole. We all have our good days and bad; being supportive through it all is important and will help to ensure a great summer. 4. Adapts quickly and stays positive. Great counselors adapt to changing situations and often drive positive change themselves. When schedules change or situations become stressful, it’s the counselors who are flexible and stay positive who keep themselves and their campers happy. By staying positive, looking for the good, and choosing gratitude, these special people help keep the Vega community happy through it all. 5. Genuinely loves working with kids. Great counselors take the time to get to know and create positive relationships with their campers. They have empathy, act selflessly, show compassion, and HAVE FUN! This genuine passion for their jobs means that they come to Vega with the commitment of giving 100% and expect others to do the same. We could go on, but we know we have the Best staff at Camp Vega. Vega is our summer home and we are filled with gratitude that we get to share it with our incredible campers and staff who make Vega the greatest place to be.